Anyone ready for some backwoods climbing. That's right, there ain't no high alpine to be found here. There's just down and dirty backwoods climbing on high-quality sandstone. Though overlooked for a long time by the big names, the locals haven't complained. Over the years they have put up excellent quality natural lines from the classic dihedral Poison Ivy (5.7+) to harder lines such as Titanic (5.11X) and Bear Bait (5.12- S), all at Sam's Throne. In addition to the classic trad routes, Horseshoe Canyon Ranch hosts a number of excellent quality bolted lines of all difficulties, even up to Sharma's famous "Paying the Rent"(5.14a). The moderate mecca of the Midwest, holding an extremely large concentration of climbing in its domain. An excellent place for those just getting into the sport of climbing, or seasoned veterans, as there is something for everyone at the Ranch. 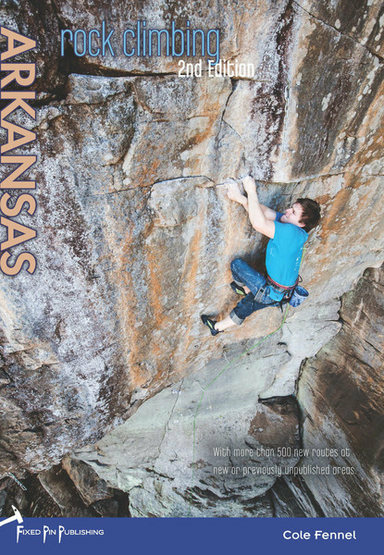 Arguably one of the single best climbing destination in the whole Midwest. Other than the famed HCR, Arkansas is on the cusp of it's golden age, with new routes going up by the day, there is something to be found around every corner and the only limitations are access and imagination. If your one for adventure and travelling off the beaten path to find some Southern Sandbagging as well as world class pitches deep within the hills of the Ozarks, it is well worth your time and memories to stray away from the ranch to see what the "Natural State" has to offer. 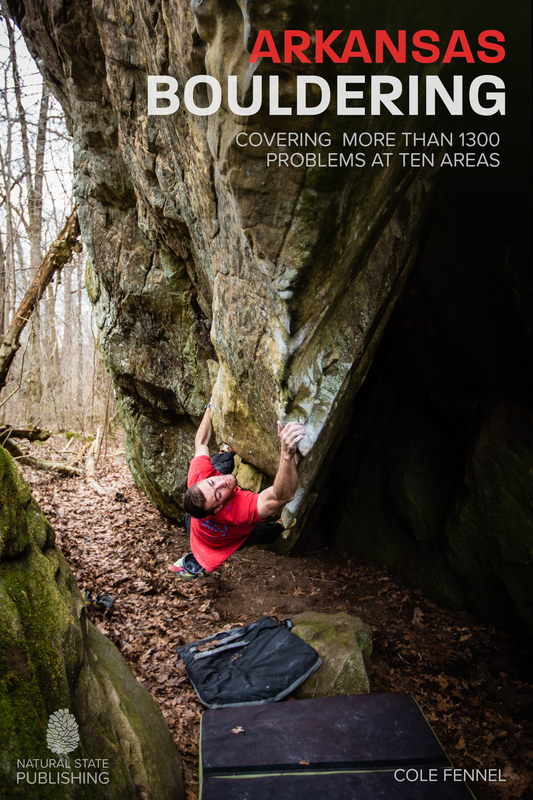 For a taste of real backwoods climbing in Arkansas, places like the Cowell area or Prohibition/Rock Creek Area offer 4 star climbs in remote settings. The latest guidebooks are as follows. 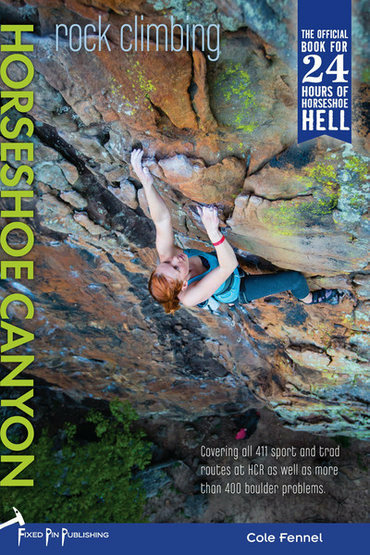 If you are climbing in the state chances are you are climbing at/near horseshoe canyon. Jasper is the closest town with amenities. There is a small grocery and some eateries. Beware, Newton County IS dry, therefor if your looking for a drink, you'll have to drive up to Harrison Arkansas. Best to prepare ahead of time. With permission from my friend Chad I post this message. If you are not aware, there's a bit of a controversy brewing in the Arkansas climbing community. The central issue is that some climbers are putting fixed chains on routes that were previously established without such niceties. By fixed chains, I'm referring to 10 inches of heavy chain link attached permanently to the bolt hangar on one end and to a carabiner on the terminal end. This amounts to a permanently fixed draw. There are generally two reasons for this. First, on particularly steep routes, as in Kentucky's horizontal terrain, it can make it easier to clip. Second, you can conveniently climb grades beyond your onsight limits since you don't need to worry about leaving bail gear behind; you can just lower off of the fixed chain-draw. Normally, the accepted community standard is that the first ascentionist gets to determine the style of a route. This rule is widely accepted. I personally think it's perhaps a bit too simple. For instance, it leaves room for people to free solo first ascents on grades well below their own climbing level. In this case, the rule fails because it allows folks who are climbing well to enforce their style on climbers of lower levels. I cite this example only to acknowledge that the community standard of the first ascent precedent is a nebulous and not always "good" way to determine what should and should not occur. But, as I said, I will explain myself. Let's try to carry on like more like a community than members of oppositional political parties. My position starts from several key principles, that I would hope are shared by the majority of climbers. Please speak up if you disagree with these. 1) Climbing is better than other "sports" because it provides a spiritual and aesthetic satisfaction far beyond competition and personal glory. 2) Climbing takes place in the natural environment, and that environment is taking a frontal assault as the world rapidly overpopulates. My logic is simple. The spiritual and aesthetic aspects of climbing are something special. They are not about convenience. They are not about numbers. They are the motivational soul that will keep you psyched and continue to nourish your soul throughout your life. If you run out of psych, you we're chasing numbers and ego. This is the energy that led me to hand paint my bolt hangers and anchors so that the beauty of the rock wouldn't be marred. When I see a couple pounds of raw chain hanging from each bolt, it is VERY hard to believe that the folks who installed that stuff are feeling the spiritual / aesthetic connection. And this lead nicely back to point number 2. Climbing takes place in the natural environment. As the world overpopulates, the natural environment will become more and more damaged. Not just from industry and global warming, but from user impact. As we speak, climber areas ARE being closed due to heavy impact. This will only increase. Even if you are unconcerned with the spiritual and aesthetic, simple access to climbing demands that we focus on minimizing impact as much as possible. If we don't address this, access will be restricted at some point during our lifetimes. I'm only 40 years old, I fully intend to be sending for another 3 or 4 decades. Protecting access by minimizing impact should be the priority of every climber. Again, a couple pounds of chain hanging from every bolt is not the way to minimize impact. I can see no other excuse for these fixed chains except convenience. If convenience outweighs your sense of spiritual and aesthetic reward, you'll run out of psyche long before you run out of life -- and that won't be fun. While it's easy to detect the ire in my words here, I hope it's also easy to detect my love for climbing. And if I have climbed with you, or even spoke with you about climbing, I think we both know that we share this love. I believe that we all know that climbing is better than other "pass times", and we should hold ourselves to the highest standards. This past weekend my wife and I took a trip to Arkansas for the first time in a number of years. I have always loved the Beauty and Serenity of climbing in Arkansas. Its a beautiful state. The lush forests and beautiful terrain and rock have always attracted me there. Not to mention the remote feeling of climbing there. This weekend my opinion has changed somewhat. Ill tell you a little about our experience this weekend. We spent the 3 day weekend camping alone at cave creek. On the second day, I took my wife up the casual route wandering spirit. I was was trying to shoot photos of her following it while sitting at the anchors on involuntary man slaughter and was so disturbed by all the chains hanging from the roof on brick attack and the other routes.. Looked like a damn climbing gym. It took so much away from the wilderness experience we had this weekend because those chains were just so noticeable and hideous. I personally have never seen anything so ugly done by climbers in the entire 20+ years i have been climbing now. It was the first time ever that I felt ashamed to be a climber. I am 33 years old so I am a member of the somewhat younger climbing generation, and I just dont get it. We also visited Hudson Mountain. It was my first time there and visited it based on recommendation of a friend, and I felt sick just walking the base of the wall. I saw chain after chain hanging below what could be an amazing wall and routes, and some bolts on routes that would be otherwise protectable with bomber natural gear. It is my opinion that all of these fixed draws should be removed and the bolts on protectable routes be pulled and the holes patched. But that is purely my opinion. I will refrain from acting on it. Its ashamed because I thought the area was beautiful, the wall was amazing and the few routes I had a chance to get on seemed pretty good. This area could be so much more beautiful without all the hunks of chain everywhere. It makes no since to me why anyone would want to take such beautiful places and degrade their physical appearance to that of an indoor gym. Especially in an area like Cave Creek where the use of fixed draws has not been traditionally acceptable in the past. I do understand the close proximity of Horseshoe Canyon Ranch and the Lack of outdoor ethics present there (which is why i will not visit there again), but will never understand the whole concept of fixed chain draws hanging all over the cliffs of Arkansas. Arkansas is so much more beautiful than that. Why can we not keep it that way. Why can we not preserve what few natural outdoor resources we still have in their natural state. but there is no missing the chains. I feel truly saddened for the first time ever to belong to this group we call climbers. How much, if any, climbing is along the Buffalo National River? Anyone looking for a climbing partner in the area? I'm up in Harrison, AR writing a thesis so I have a lot of time. Mountain Project's list of Arkansas classic routes is misrepresentative: excellent climbing abounds beyond Horseshoe's realm. I expect one day that we'll all be astounded at the explosion of Ozark route development that occurred under our noses, clip-ups that rival that of RRG with a pump that can only be found in the south, and trad lines true to old school spirit found at many of the conuntry's earlier crags. Arkansas is home to many back-woodsy secret cliffs and will be known as a cooler-month destination. For now, Sam's Throne is not to be missed. Bring provisions though, there's nothing around. Jamestown and Mt. Magazine are also quite good, both hosts of classic AR lines (the latter boasting the most honest grades in the state).